When a substance exists as part liquid and part vapor at saturation conditions, its quality (x) is defined as the ratio of the mass of the vapor to the total mass of both vapor and liquid. Thus, if the mass of vapor is 0.2 lbm and the mass of the liquid is 0.8 lbm, the quality is 0.2 or 20%.Quality is an intensive property. Quality has meaning when the substance is in a saturated state only, at saturation pressure and temperature. 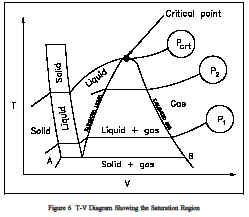 The area under the bell-shaped curve on figure 6shows the region in which quality is important.